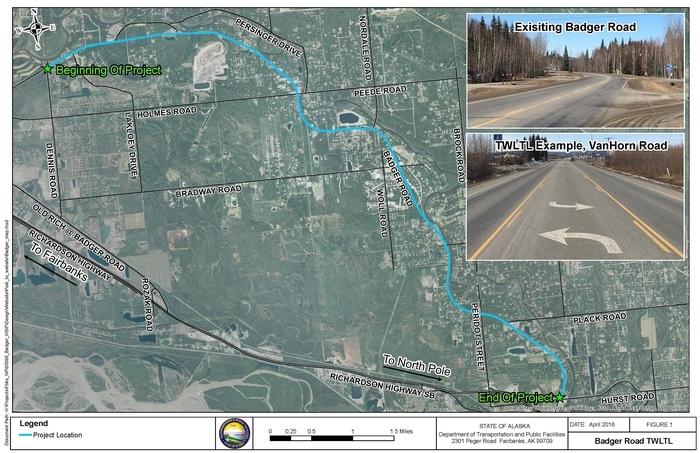 The Alaska Department of Transportation & Public Facilities (ADOT&PF), in cooperation with the Alaska Division of the Federal Highway Administration (FHWA), proposes to upgrade Badger Road from Dennis Road to Hurst Road to reduce turning related crashes. Upgrades will consist of construction of a Two Way Left Turn Lane (TWLTL) and curve improvements at the Holmes/Peede Road intersection. This project is being developed under the Highway Safety Improvement Program (HSIP). This project will upgrade Badger Road from Dennis Road to Hurst Road with a Two Way Left Turn Lane. Road widening may be required to accommodate the TWLTL, however, no right of way acquisitions are anticipated. The project will also provide curve improvements at the Holmes/Peede intersection such as minor curve flattening and reducing the cross-slope. Signing, striping, drainage and utilities will be updated to accommodate the TWLTL. The Department of Transportation identified Badger Road as having a higher than average crash rate. A Road Safety Audit (RSA) was then commissioned to assess the cause of these crashes and recommend solutions. The RSA was conducted by public safety officials, traffic enforcement and traffic engineering personnel. The RSA team observed that Badger Road has an average of 22 driveways or minor side streets per mile which is likely a contributing factor to the high crash rate. Construction of a continuous TWLTL can reduce the severity and frequency of crashes on Badger Road. Reduce crashes by approximately one-third as compared to undivided roads. Increase roadway capacity as compared to undivided roadway. Maintain similar access to residences and businesses. Additional information on the benefits of TWLTL’s can be found here. The RSA team also noted several traction related concerns with the Holmes and Peede intersection. Historic crash data also shows this intersection has the highest crash frequency on Badger Road within the project limits and therefore this curve will be improved with the project. The completed Design Study Report can be found here 30mb. The Department is currently in final design, with construction anticipated for the summer of 2019.